Osun ( pronounced; "/ˈōSHo͞on/") is an inland state in south-western Nigeria. Its capital is Osogbo. It is bounded in the north by Kwara State, in the east partly by Ekiti State and partly by Ondo State, in the south by Ogun State and in the west by Oyo State. The state's current governor is Adegboyega Oyetola, who was declared winner of the September 2018 governorship elections. He was declared winner of the September 27, 2018 rerun elections after the initial September 22, 2018 gubernatorial election was declared inconclusive by the Independent National Electoral Commission. Osun is home to several of Nigeria's most famous landmarks, including the campus of Obafemi Awolowo University, Nigeria's pre-eminent institution of higher learning. The university is also located in the ancient town of Ile-Ifẹ, an important early center of political and religious development for Yoruba culture. Other important cities and towns include the ancient kingdom-capitals of Oke-Ila Orangun, Ila Orangun, Ijebu-Jesa, Ede, Iwo, Ejigbo, Modakeke, Ibokun, Ode-Omu, Ifetedo, Esa-Oke, Ilesa and Igbajo. The modern Osun State was created in August 27, 1991 from part of the old Oyo State. The state's name is derived from the River Osun, the venerated natural spring that is the manifestation of the Yoruba goddess of the same name. The former Governor Olagunsoye Oyinlola launched and laid the foundation for the groundbreaking of Osun State University with six campuses (Osogbo, Okuku, Ikire, Ejigbo, Ifetedo, and Ipetu-Ijesha) strategically located across the state. Important cultural events in the state include the Ori Oke and Egungun festival in Iragbiji, Olojo in Ife and the Osun Osogbo festival. Every year, adherents and non-adherents of Osun, one of the Orisa (the traditional deities of the Yoruba people), travel from all over the world to attend the annual Osun-Osogbo festival in August. Visitors include nationals of Brazil, Cuba, Trinidad, Grenada, and other nations in the Americas with a significant Yoruba cultural heritage. Annual traditional festivities and invocations of the Osun goddess are held along the banks of the river bearing her name into which – according to Yoruba Oratory traditions – she transformed. 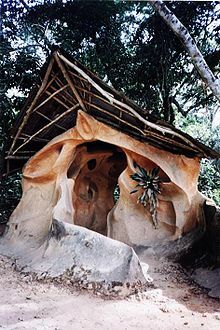 Ọsun-Ọsogbo Groove, the shrine of the annual rites of the deity and an important artistic center, was declared a World Heritage Site in 2005 citation needed. Osun State is divided into three federal senatorial districts, each of which is composed of two administrative zones. The state consists of thirty (30) Local Government Areas and Area office (Modakeke), the primary (third-tier) unit of government in Nigeria. Enoch Adeboye- General Overseer RCCG. Gbenga Adeboye- (1959–2003) was a musician, comedian and radio presenter. Chief Adebisi Akande- Former Governor of Osun State. Ogbeni Rauf Aregbesola – Former State Governor. Chief Bola Ige SAN-(1930–2001) Politician and Lawyer. Prince Olagunsoye Oyinlola- Former Governor of Osun State and Former Military Governor of Lagos State. ^ "Local Government Areas – The Official Website Of The State Of Osun". Osun.gov.ng. Retrieved 26 August 2017. This page was last edited on 29 March 2019, at 20:40 (UTC).